Using a global network of telescopes to see “the unseeable,” an international scientific team on Wednesday announced a milestone in astrophysics - the first-ever photo of a black hole - in an achievement that validated a pillar of science put forward by Albert Einstein more than a century ago. Black holes are monstrous celestial entities exerting gravitational fields so vicious that no matter or light can escape. 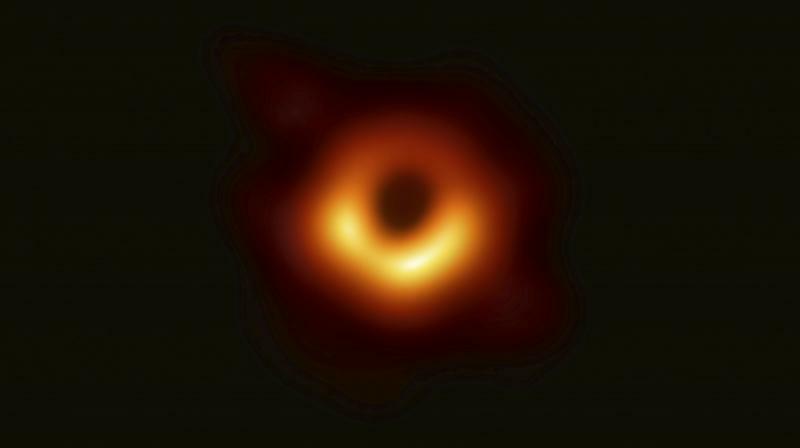 The somewhat fuzzy photo of the black hole at the centre of Messier 87, or M87, a massive galaxy residing in the centre of the relatively nearby Virgo galaxy cluster, shows a glowing ring of red, yellow and white surrounding a dark centre. Black holes, phenomenally dense and come in various sizes, are extraordinarily difficult to observe by their very nature. A black hole’s event horizon is the point of no return beyond which anything - stars, planets, gas, dust and all forms of electromagnetic radiation - gets swallowed into oblivion. “We found literally the proverbial hole in the middle of this galaxy, and to me, that is just stunning,” said astrophysicist Dimitrios Psaltis of the University of Arizona, the EHT project scientist. The project has also targeted another black hole - Sagittarius A* - situated at the centre of our own Milky Way galaxy. Scientists expressed optimism about getting a picture of that one, perhaps within a year. Sagittarius A* possesses 4 million times the mass of our sun and is located 26,000 light-years from Earth.